A woody, clinging vine with large, flat clusters of white flowers in late spring. Outer flowers are sterile and inner flowers are fertile and small, creating a lacecap effect. The foliage is heart-shaped and rich green. The bark on older stems is rich brown, exfoliating. 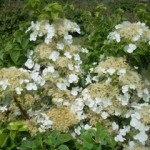 It is best grown in a rich, fertile, moist, but well-drained soil in part to full shade. 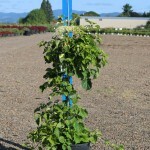 It can tolerate full sun only with consistent, moist soils. It is native to wooded valleys, stream banks and mountain slopes in the Himalayas and China.